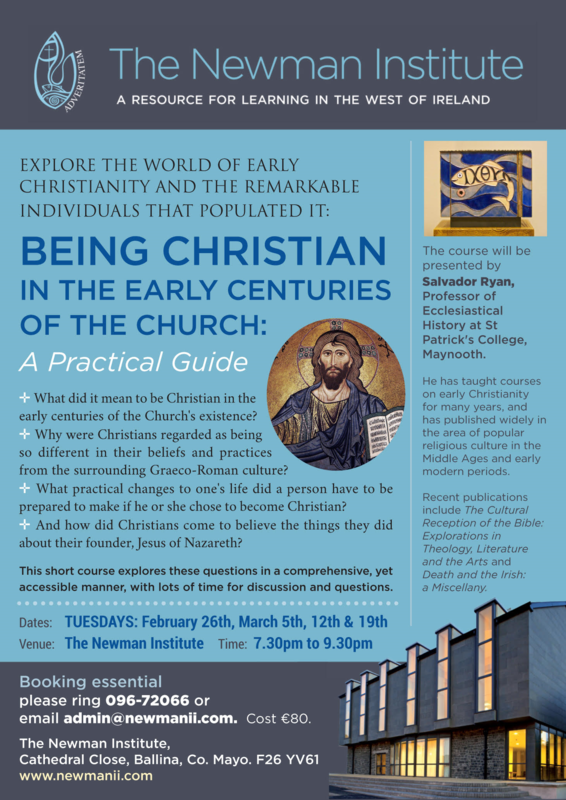 This four week course will be delivered at the Newman Institute, Ballina, by Professor Salvador Ryan, Professor of Ecclesiastical History at St. Patrick’s College, Maynooth. What did it mean to be Christian in the early centuries of the Church’s existence? Why were Christians regarded as being so different in their beliefs and practices from the surrounding Graeco-Roman culture? What practical changes to one’s life did a person have to be prepared to make if he or she chose to become Christian? And how did Christians come to believe the things they did about their founder, Jesus of Nazareth? This short course explores these questions in a comprehensive, yet accessible manner, with lots of time for discussion and questions. Prepare to be surprised by much that you will hear as you explore the world of early Christianity and the remarkable individuals that populated it. Salvador Ryan is professor of Ecclesiastical History at St Patrick’s College, Maynooth. He has taught courses on early Christianity for many years, and has published widely in the area of popular religious culture in the Middle Ages and early modern periods. Recent publications include The Cultural Reception of the Bible: Explorations in Theology, Literature and the Arts (Dublin: Four Courts Press, 2018) and Death and the Irish: a Miscellany (Dublin: Wordwell Press, 2016). Dates: Tuesdays, February 26th, March 5th, 19th and 26th from 7.30 to 9.30.